Not many of us need much to do with Louis Vuitton luggage. With the amount of cash it takes to buy the thing, you could have already been somewhere fabulously, lifechangingly exotic and back. Besides, why pay big money dollar for something that will get thrown around mercilessly from port to port, conveyor belt to conveyor belt, without so much a care for its well being? 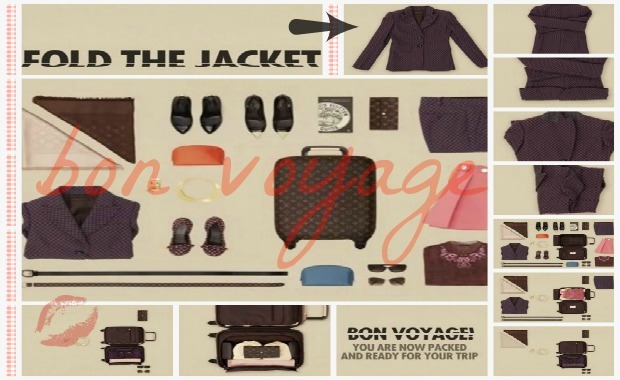 Anywho, it turns out that the bag itself doesn’t matter much, because Louis Vuitton has made these super easy-to-follow and practical video guides for how to pack and unpack your things in a way that preserves the beauty of your finery and maximizes space inside the case. We love it! Since school is about out and summer is ONN, why not take your best duds and immaculately pack for your summer adventure? Of course, if you happen to be going on a top down, off-the-cuff adventure on the open road, well, a bikini, cutoffs and tee tossed in a beach bag will do just fine as far as packing goes. But for other occasions, those which require planning, thoughtful outfit selection and transporting said outfits with the least bit of wrinklage, then these videos are just thing. And even though the medium of the message is all blingy blingy LV status, that doesn’t mean that the contents of the video aren’t extremely valuable to pretty much everyone. After all, it’s not like you have to fly to Berlin, Lisbon or Stockholm to require you get your luggage right–a simple weekend trip, like that wedding your family will be running off to later this summer, is just the occasion to perfectly pack your wares.